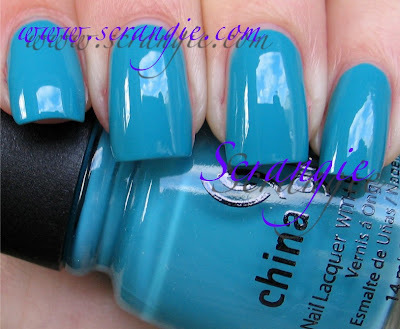 Scrangie: China Glaze Spring 2010 Up And Away Collection Preview! China Glaze Spring 2010 Up And Away Collection Preview! I'm so excited I don't even know how to start this post. I just received my samples of China Glaze's upcoming spring collection, "Up & Away" and as soon as I saw them a wave of happiness swept over me! These are seriously gorgeous and the promo pic of these does not do them justice. They are utter creme perfection. Flyin' High. This is kind of in between a bright sky blue and an aqua-looking teal. I'd say it's more blue- it's closer to Shower Together than it is to Custom Kicks. Whatever the exact shade is, it's gorgeous, glossy and so, so happy looking. The name "Flyin' High" makes me think of a line from my favorite Children of Bodom song to listen to when I'm sad... and this is so completely opposite of that song it makes me laugh. I know, random, right? I can't help that that's the first thing that popped into my head when I saw Flyin' High. Four Leaf Clover. Super amazing awesome bright nearly-neon teal green creme. My picture is not really accurate to how this color actually looks. It is so bright and vibrant that it freaked out my camera. Seriously! My camera couldn't even focus on this, this one picture is the only shot that even remotely turned out! That is definitely a measure of how awesome this polish is. Picture it much more green, almost neon teal. Deeper with more pigment. You just have to see this one in person. It's... It's... I don't even have a word for it, it's so good... It's über, that's what it is. Green lovers, I'd call this a must have. Definitely. Grape Pop. Bright medium candy purple creme. What a perfect purple. It's a little bit less blue-y than it looks in my picture, but not by too much. It leans on the side of blue-purple more than red-purple, but it's pretty close to center. This is one of the more unique purple cremes in my collection, the closest cousin to it would be Rescue Beauty Lounge Mismas. Happy Go Lucky. Bright lemon yellow creme. Another winner. It's quite possibly the best yellow creme in my collection. 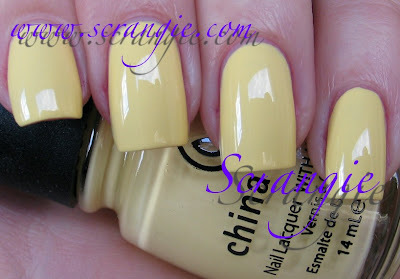 It's the perfect shade of bright sunshine yellow for my skintone, and it goes on streak free and perfect in two coats. I can't say that about a lot of yellows. 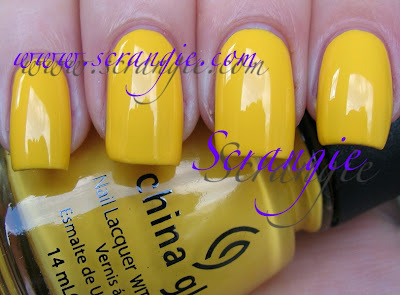 China Glaze must have been working overtime on their yellow formula, cause this is just about as good as it gets. Heli-Yum. Bright deep pink creme. China Glaze calls this shade raspberry, and I'd say that's a pretty good description. It reminds me of raspberry sauce, maybe a little lighter than the actual stuff, more like a raspberry candy. Another super happy looking shade. This one has a jelly-like quality to it, with that kinda shiny-squishy look, but it's too dense and opaque for me to consider it a true jelly. Oh, and I love the name of this one. Hahaha! High Hopes. Bright pinky-orangey coral creme. China Glaze calls this one Guava, but I'm not entirely sure what color guava is. I've eaten a guava before and it's kind of a rich pink color on the inside... I'm going to call it coral. Bright, bold coral. Very flattering. Lemon Fizz. Pale lemon sorbet yellow. A pale yellow that doesn't make my hands look like death! Yay! This is very light but it's not exactly soft. It's crisp- it has a very fresh and... solid? bold? look. It has a little hint of honeydew green in it, and I think that sets it apart from a lot of the other pale yellows in my collection. Also applies like a dream, extremely rare for yellows, and pastel yellows especially. Light As Air. Very light lavender creme. This one makes me think of really fancy petit-fours with little sugared violets on top. This is a really cool color. Like the others, it's a light shade but since it's so dense and stark and creamy it has a very bold look. It really stands out. Again, I'm pleased to find such a nice light lavender that doesn't make my hands look like death! Normally shades like this aren't great on my skintone, this one is different. Peachy Keen. Light peach creme. Before you ask, I checked, it's not even close to MAC Seasonal Peach. This is pretty unique in my collection- I've never really thought about it before but I just don't have many peaches in my stash. How odd. Anyway, this is a touch paler in real life- a lot like the bottle color. Re-Freshmint. Pale mint green. This is a really light shade of mint green, but not as light or as blue as Essie Mint Candy Apple. It is more yellow toned than blue toned and it is fabulous. Mint green shades seem to be huge right now, and I think that this is one of the nicer ones on my skintone. Something Sweet. Soft light pink with a little bit of lilac. See, this one is such a contradiction! On one hand, it's soft, light, girly, delicate baby pink... But on the other hand it's stark, dense, bold mod 60's vintage pink that really seems anything but soft. It's kind of white-out creamy, but very easy to apply. Sugar High. Nearly-neon candy pink. I think this is just about as bright as pink can get before it becomes a true neon. This is the only one that gave me a little trouble in application- it seemed a little sticky. If I would have let my coats dry a little longer in between, I probably wouldn't have had much of a problem, but hey, I'm impatient when it comes to my nails! This shade of pink makes me think of all the Barbie stuff I had as a kid. Remember how they used to come with a plastic hairbrush, and it was almost this exact shade of hot pink? The formula on these was excellent. Outstanding, even. The key word here is 'pigment'. These are positively loaded with pigment and they are very thick. That's a good thing. That means one and two coat coverage. A lot of these shades did give me one coat coverage- Four Leaf Clover, Flyin' High, Grape Pop, Sugar High, but I did two coats of each. They didn't need more than two coats. Like I mentioned before, the consistency of these polishes is very thick, but it isn't runny like it used to be. These actually kinda reminded me of Rescue Beauty Lounge's creme formula- thick, smooth and pigmented. The drying time on these is slightly inconsistent, though- some dried very fast and some took about the same amount of time as usual. Maybe they do have a little neon in them. Overall, I am incredibly impressed with this entire collection. China Glaze have really outdone themselves. Based on the promo picture, I could have gone either way with these- they looked really cute, but they also seemed to be 'normal' pastel cremes. I'm not much of a pastel wearer. And then I thought, "These are all cremes. They could be really boring." But these... these aren't wimpy, boring barely-noticeable pastel cremes. The super dense bold creme base in all of these makes the colors stand out as if you had applied them over white. I keep using the word 'bold' over and over again because that's all I can think of to describe the finish of these. Bold and dense and solid. I love the overall theme of this collection as well. I mean... let's face it... A lot of us are pretty bummed out right now. 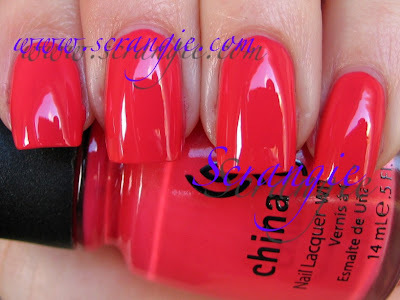 The main theme China Glaze wanted to convey with this collection was happiness. The words that come to mind are happy, lighthearted, candy, fun, cheerful, whimsical, carefree... Up and away, lifting your mood, taking you away, there's even a bundle of brightly colored balloons on the picture. I really needed this collection! It honestly brought a smile to my face and I am really looking forward to wearing full manicures of each and every color included. China Glaze did a great job on these. The finish is impeccable, the formula is improved, the colors are ridiculously happy and cheerful, and Four Leaf Clover should win some sort of award for being awesome. I don't know the exact release date for this collection, but since it's a Spring collection, I'm going to guess late December or early January. If I do find out the actual release date, I'll update the post with that information. Hoo.Boy....I want THESE!!!!! LOL Thanks for sharing the swatches. So would these be usable as Konad top colors, do you think? Wow, this collection looks way better than I thought! I am really going to have to restrain myself from draining my bank account because these look so beautiful! I am excited that the formula is great, I love opaque polish! Chocolate Kisses, you're welcome! They're so happy, aren't they? Gildedangel, I know, I was totally surprised by how bright they actually are in real life, completely unexpected! 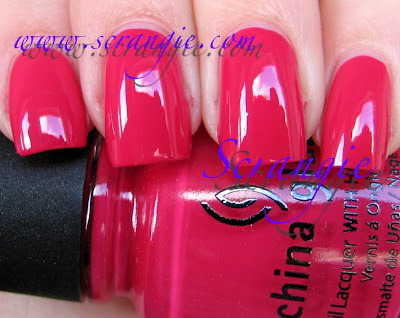 Great review and swatched Just wondering, how would you compare Heli-Yum to OPI's Miami Beet? I wanna buy alllll of them your swatches are awesome! Way to go China Glaze you rock. thanks for the great reviews! i thought the same, not really interested, but now that i have seen them swatched i have totally changed my mind! Love them. Oh yes - how utterly perfect for Spring. There isn't one I don't want. What an awesome collection! Thanks so much for your review, Scrangie!! I think China Glaze has really been stepping up their game lately - the formula has improved and their colors (mmmm glitters) are interesting and unique. Love them!!! So gorgeous!!! And I think that the advertising in these is perfect. The focus is on fun, happiness and color. . not. . you know >_> . I am glad there isn't any weird strawberry eating in this campaign. You've just killed me Scrangie!! I needz AOT except for Peachy Keen and not sure about Light As Air. I've been dying for this since last night when I saw the Twitter pictures for the first time. What a wonderfully happy collection!! I want them ALL. My wallet is going to cry. These are so incredible. I am in love with China Glaze. What an amazing collection! All killer, no filler. I don't think I'll be able to choose a few - I suspect I will buy all. Wow, thanks for the awesome and thorough review of these. I am not ready to get into spring and summer colors, BUT I love these and am so excited about the shades and the OPAQUENESS!! I will probably need to get them all. EEEEKKKKK!!! The pastels are fab, I like the bolder one's too, but the pastels somehow hand an edge to them. *squeee*. I will be stopping by Sally for these as soon as they are released. I knew I wanted this whole collection when I first heard about it but it's so nice to know that they are pigmented and apply well. Thanks for the review and the gorgeous swatches! These reminded me of the colours of children's clothing in the 80's. They have a youthful, blissful and retro feel to them. have you thought about starting your own nail line? I think it would be fabulous. OH MY GOD. I am so freaking excited. So many of these are FABULOUS! Thanks so much for sharing these!! Pretty colors...I think they might have been a little inspired by a certain Pixar movie that was recently released on DVD, and that makes me feel happy and Up too! Thanks for sharing the swatches, they are gorgeous. Totally hate cremes! Yucko from me - sorry. I think I just came...I need almost all of these. Just what I needed. This collection seems amazing, I love creme polishes and this seems to fit my mood just perfectly. Based on the promos I thought there's only one shade I don't want and now I can't seem to find any. And a pastel yellow that is not hard to apply? YAY! I love your review of these.You have made me want every single colour! The only one I'd like is Grape Pop. The other colors just aren't me. Eeeeek! I think this is the first collection I'm going to get in its entirety. They're cremes! Beautiful, bold, well-applied and unique cremes! This makes my day. OMG I want them all, I will order them all for sure!A big Thank you from Germany for sharing this swatches! And don't forget the fabulous song from the 1960's! That one, too, goes up and away and features a beautiful balloon. I saw the promo shots and originally thought, meh, but I'm really liking some of the swatches. Thanks so much for letting us see them so soon! I'm much more excited about these now than I was before. Hooray! And another big Thank you from Mexico!! I thought I would only buy a couple of these... But after looking at your amazing swatches -as usual- I want the all!! Thank goodness for your swatches! I've been dying to see the yellows and greens from this collection, but prob would have passed on the pinks and the peach. Now I know better. I will be buying ALL of these! God, I love China Glaze! I'm drooling over these! <3 Thanks for showing! I love cremes and pastels so I love this collection. I want all 5 of the lighter shades. re-freshmint looks really good, wonder how close it is to hey get in lime/mint apple. These are gorgeous! Love the swatches Scrangie! I love the happy theme, too! I really hated Four Leaf Clover when the swatch was posted on ChinaGlaze's twitter. It was super nasty dull looking teal. You say that yours swatch isn't quite accurate to true color either, but is it more accurate than the swatch posted by ChinaGlaze @ twitter? I love greens, but I'm also really particular about them. And thanks for posting the swatches! I've only seen the ones from china glaze's twitter and it's good to have some comparison ones! I'm just not drawn to buy any because they are cremes. I rarely like to wear a creme, but I can totally appreciate them on your nails! POLISH-gasm! i think this may be my second favorite collection EVER.... WOWOWOWOWOW!!! is it true? can it be?? has china glaze perfected the creme?? i think so! i have to mop up the drool now, but thank you so much for posting these beautiful swatches. now i have to wait in agony for however long it takes for these beauties to get on the shelves to buy :) love ya! oh great, i want them all! This collection reminds me of Sofia Coppola's film Marie Antoinette that starred Kirsten Dunst. The colors in the movie were so soft while being simultaneously vibrant. Up and Away just screams "happy" to me. I can't wait! Gah, I want them all! It is great to see yellows that are not streaky, the colours look like so much fun, and the advertising is perfect. Excellent post, Scrangie, and your commentary is great! Wow, I'm definately going to have to invest in some of these! I have a question, scrangie. How close in color are Re-Freshmint and OPI's Hey! Get in Lime? LOVE Grape Pop. Ugh, and I just splurged on Mismas. They're so fun! I wanted to ask for your opinion on Re-Freshmint. Is it a close match to CG Groovy Green? It's OOS in all the places I "e-shop". Thank you! THANK YOU SOO MUCH!!! I've been dying to see these on nails and they don't disappoint! What an amazing collection!! Can't wait to get these babies!!!! BTW do you think Happy Go Lucky is similar to OPI The "It" Color? Or is it more of a sunny/lemony yellow? OMG!! I want them all!! Thanks for the swatches!! Thank you for these! :) I think I prefer shimmers to cremes, but I'm loving these colors. They make me think of Easter and Jordan almonds and sunlight starting to peek out from the fog. I might need all of them. Looks Awesome! I cannot WAIT! When I first saw the promo picture I wasn't too excited about most of the colours but these swatches change my mind. Four leaf clover, grape pop, refresh mint, and heli yum look awesome. OMG. GIVE ME ALL OF THEM! These swatches definitely made my day! All the colors look amazing and I can't wait to get my hands on them. Your pictures look awesome as usual! Noooo these are a lot cooler than I'd thought they'd be. I'm running out of storage :P Thank you! These colors are so cute! And good formula, too? YAY! I love when cremes are nice and easy to use. I haven't found a good light yellow and it looks like Lemon Fizz might be the one. I want them all but I'm definitely getting Heli-Yum, Light As Air, Something Sweet, & Peachy Keen. I am in love with this collection! China Glaze- you've outdone yourselves! Thank you for sharing these swatches, Scrangie. They're amazing! I only wanted the greens when I saw the pictures. Now seeing them swatched it's a different story. They are all beautiful and different. Thank you so much for all the hard work you do on this blog. I really appreciate your fine writing and beautiful pictures. I love cremes and have been desperately waiting for Up And Away swatches. So thanks a lot! I LOVE Re-Freshmint as much as I thought I would based on the promo pictures. Wow - these look awesome!! I like exactly half of this collection. Not at all crazy about the pastels. What I am so thankful for though, is your REVIEW of the entire collection. It is invaluable to know about the formula, application and opaqueness of each one. This helps us make informed decisions before we spend our hard-earned money. We Love you, Scrangie! I want exactly half of this collection. Not at all crazy about the pastels. What I am very thankful for though, is your REVIEW of the collection. It is invaluable information to know about the formula, application and opaqueness of each one. We can make informed decisions before we spend our hard-earned money. Thank you, Scrangie! do you know where i could get these online to ship to the UK with in-expensive shippping ? AHHHH I WANT THEM TO COME OUT RIGHT NOW! I'm pretty sure I will have to buy the wholeee bunch, they look that amazing. Woww! Wonderful review, Scrangie! Thank you! I think I'm going to buy the Peachy Keen and Re-freshment. I love the mint green that's so 'in' right now! It's so nice for wearing with black to spruce it up a bit. Very Christmas-sy too! I can't wait for these!!! I loooove when this kind of collection comes out when it is sleeting and disgusting outside. It makes me think of the warm weather coming! Oh. My. Word. I am in love! These colours are divine! I've been looking for colours like these for ages. I think China Glaze have answered my prayers. Your photos are amazing. I hope these are going to be on sale in the UK. I have to get these! Oh man, the creme addict in me just wept with joy. I covet all of these, even the pink ones, and I don't even like pink. You made my weekend with these. Seriously, my friend IMed me early in the morning just to make sure i had seen these. LOVE. Amazing pics. I love this entire collection. It makes me happy just by looking at the pics. It's so bright and cheerful. I can really use bright and cheerful right about now. Also, I emailed Irene with ChG about the exact release and she said mid-January. I cant wait for these to come out! I am gonna get EVERY single color! Wow there are some great colors in this collection. I'm really looking forward to them. Love the mint green! This is very pretty! Perfect for spring. I think I'm going to have to get them all. There's always a first time. The time has come! When do these become available and does anyone know where there available to buy in the uk? don't think I've been this excited polish-wise for a season's release, but this spring is going to bring me lots of pretty polishes! Thanks for the great swatches! Your review changed my perspective on pastels. It's so hard to find pastels that looks good on my asian skin. Let me know how it goes w/ Konad.. I'm very interested! Thanks for the swatches!!! Looove these swatches. Just purchased Four Leaf Clover, and Grape Pop. Almost purchased Light as Air and Happy Go Lucky, but not sure how yellow looks on my olive skin tone. Also, Light as Air seems pretty close to OPI Done Out in Deco maybe??? Lovely collection and great pictures. I always love your pics! But these look like they would only look good on *ahum* white people. I'm grey hahha black/white parents and I just don't think these would look good on me. Too bad. Thank you for swatching them, I'm just placing an order and your pics and comments are really useful! !